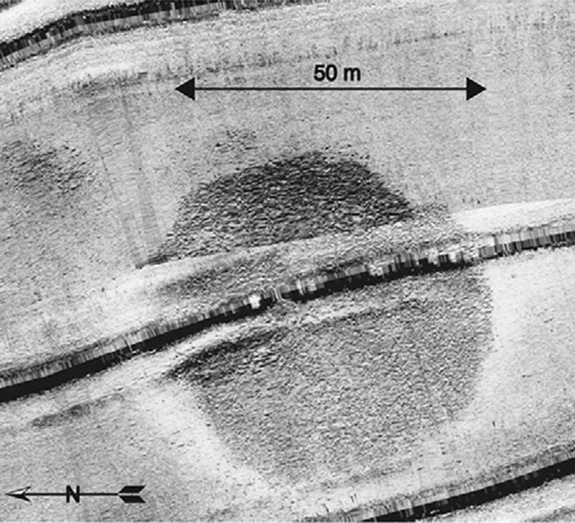 The circular structure was first detected in a sonar survey of part of the sea in the summer of 2003. A giant "monumental" stone structure discovered beneath the waters of the Sea of Galilee in Israel has archaeologists puzzled as to its purpose and even how long ago it was built. Rising nearly 32 feet (10 meters) high, it has a diameter of about 230 feet (70 meters). To put that in perspective, the outer stone circle of Stonehenge has a diameter just half that with its tallest stones not reaching that height. It appears to be a giant cairn, rocks piled on top of each other. Structures like this are known from elsewhere in the world and are sometimes used to mark burials. Researchers do not know if the newly discovered structure was used for this purpose. The structure was first detected in the summer of 2003 during a sonar survey of the southwest portion of the sea. Divers have since been down to investigate, they write in the latest issue of the International Journal of Nautical Archaeology. 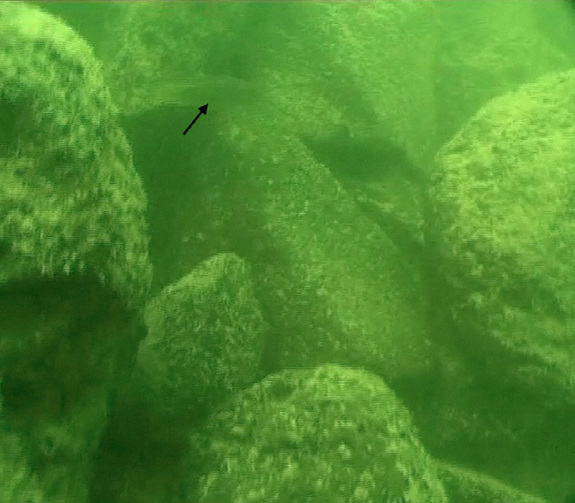 "Close inspection by scuba diving revealed that the structure is made of basalt boulders up to 1 m (3.2 feet) long with no apparent construction pattern," the researchers write in their journal article. "The boulders have natural faces with no signs of cutting or chiselling. Similarly, we did not find any sign of arrangement or walls that delineate this structure." They say it is definitely human-made and probably was built on land, only later to be covered by the Sea of Galilee as the water level rose. "The shape and composition of the submerged structure does not resemble any natural feature. We therefore conclude that it is man-made and might be termed a cairn," the researchers write. More than 4,000 years old? Underwater archaeological excavation is needed so scientists can find associated artifacts and determine the structure's date and purpose, the researchers said. Researcher Yitzhak Paz, of the Israel Antiquities Authority and Ben-Gurion University, believes it could date back more than 4,000 years. "The more logical possibility is that it belongs to the third millennium B.C., because there are other megalithic phenomena [from that time] that are found close by," Paz told LiveScience in an interview, noting that those sites are associated with fortified settlements. The researchers list several examples of megalithic structures found close to the Sea of Galilee that are more than 4,000 years-old. One example is the monumental site of Khirbet Beteiha, located some 19 miles (30 kilometers) north-east of the submerged stone structure, the researchers write. It "comprises three concentric stone circles, the largest of which is 56 m [184 feet] in diameter." If the third-millennium B.C. date idea proves correct it would put the structure about a mile to the north of a city that researchers call "Bet Yerah" or "Khirbet Kerak." During the third millennium B.C. the city was one of the biggest sites in the region, Paz said. "It's the most powerful and fortified town in this region and, as a matter of fact, in the whole of Israel." Archaeologist Raphael Greenberg describes it in a chapter of the book "Daily Life, Materiality, and Complexity in Early Urban Communities of the Southern Levant" (Eisenbrauns, 2011) as being a heavily fortified 74-acre (30 hectares) site with up to 5,000 inhabitants. With paved streets and towering defenses its people were clearly well organized. "They also indicate the existence of some kind of municipal authority able to maintain public structures ..." Greenberg writes. The research team says that, like the leaders of Bet Yerah, whoever built the newly discovered Sea of Galilee structure needed sophisticated organization and planning skills to construct it. The "effort invested in such an enterprise is indicative of a complex, well-organized society, with planning skills and economic ability," they write in their journal paper. Paz added that "in order to build such a structure a lot of working hours were required" in an organized community effort. Paz said that he hopes soon that an underwater archaeological expedition will set out to excavate the structure. They can search for artifacts and try to determine its date with certainty. He said that the Israel Antiquities Authority has a research branch capable of excavating it. "We will try to do it in the near future, I hope, but it depends on a lot of factors."